When I posted this leafy corner for a hand embroidery design, folks seemed to like the fact that it is a continuous line drawing. Designs like this made from a continuous, unbroken line can be used in all kinds of applications – they work great as hand embroidery designs, of course, but they can also be used for quilting patterns, braid work (soutache embroidery), tambour work, and all kinds of other crafting purposes, such as card-making, scrapbooking, and the like. Really, the possibilities are limited only by your imagination! 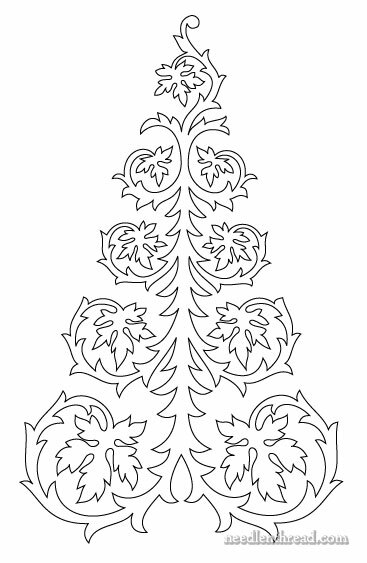 Today’s free hand embroidery pattern, from an old book published over 100 years ago, evokes the idea of a Christmas tree, thanks to its triangular shape, but it can also be used as an autumnal design. The leaf elements are quite fall-ish. When I first saw this line drawing, I fell in love with it! I really like the shape, and I love the incorporation of the leaves. Unfortunately, in the copy of the book that I have, the design is skewed – it is not only off-center, but it slopes downwards to the right. I decided to clean it up for ease of printing, and while I was at it, I straightened it out significantly. My original plan (this was a couple years ago!) was to use it on the ends of a table linen for an autumn table. I thought the design would look particularly pretty, couched over with a fine golden cord, on a Thanksgiving table. You can easily resize the design on a photocopier or your printer. You can find plenty more free hand embroidery patterns right here on Needle ‘n Thread, if you’re itching for something to stitch. I hope you enjoy it! Feel free to share the design with your quilting buddies or your paper crafting friends, who might find a use for it, too! December 8, 2014 Embroider a Christmas Tree! I really like that tree. Just in time for Christmas. It mightn’t have pine needles but the shape is perfect, the leaves are decorative and it’s different. All appealing to me. Thank you. AND, special thoughts are with all in the storm areas. This certainly looks like a Xmas tree. I would like to embroider it, but the one problem is have is how to handle the points. Can you help? Also what type of background and thread would you use? Many thank. Lovely pattern. Loved it because of its continuity. Will be working on it soon. Thank you. It does look sort of Christmasy. If someone insisted on a more traditional look, I’d think they could figure out a pine cone pattern instead of leaves. Or use charms? JustGail suggested using charms as ornaments, but I’m thinking you could also use beads to make it Christmasy. I love this pattern. Thanks! What a lovely pattern I love the continuous line and so right for Christmas or as you say for autumn. On a smaller scale It would look nice on a Christmas card or it could be repeated for a table cloth or napkin. Lovely!!! This would be lovely done in a Holbein stitch, perhaps using an overdyed silk or cotton floss. I may have to add it to my list of things to do. *shrug* Guess I’m just not in the Xmas spirit! LOL! Gold and fall palette on a rich burnt orange fabric…YUM! Next Next post: Boo! And Give-Away Winners!